In Part 1, find and analyse phrases which set up an opposition between an isolated and secure world of withdrawal and the social active world. In Part 2, what causes the change in her? In Part 3, note the change in the refrain where Lancelot formally takes over her place, note the anaphora (repeated sentence/clause/phrase/word beginning). In Part 4, note how the weather changes. Does this suggest her entanglement with the natural cycle and does this presage her death? If so, what is the significance? The use of two parts being in the present and two in past, with each part ending in a speech. First quatrain: same rhyme for all 4 lines in each verse. Second quartrain: same rhyme for 3 lines plus refrain in each verse. Second stanza: feminine rhyme; tripping rhythm changes to slow drawn out ‘Four grey walls …’ shows polarity between Camelot and Shalott. Consider the difference. 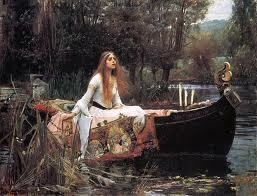 Lancelot appears as a reflection in the mirror and also as a reflection from the river; is he illusory? Consider the meaninglessness of Lancelot’s ‘Tirra lirra’ and his inane comment about her face. These contrast with…? Do you feel that light, the water and the mirror = revelation, life-flow and identity? Develop response. Does ‘burning’ suggest passion here? What might be the significance of inscribing her name? Identify how she fulfils criteria of the medieval tradition of courtly love: how is she unobtainable, unpossessable and unknowable? What is implied in the in the contrasting actions weaving the web and writing her name? A separation of the poet from man and society – and social engagement is viewed ambivalently. The plight of individual consciousness bereft of the Romantic sense of harmony. The enclosed female, locked in contemplation, looking out onto a male world of action. The Lady of Shallot leaves the restricted area she has been assigned to in a male dominated world. An allegory of the nature and dangers of the human imagination. How might the poem show life is antipathetic (diametrically opposed) to art? What might be concluded about what it is to be an artist?